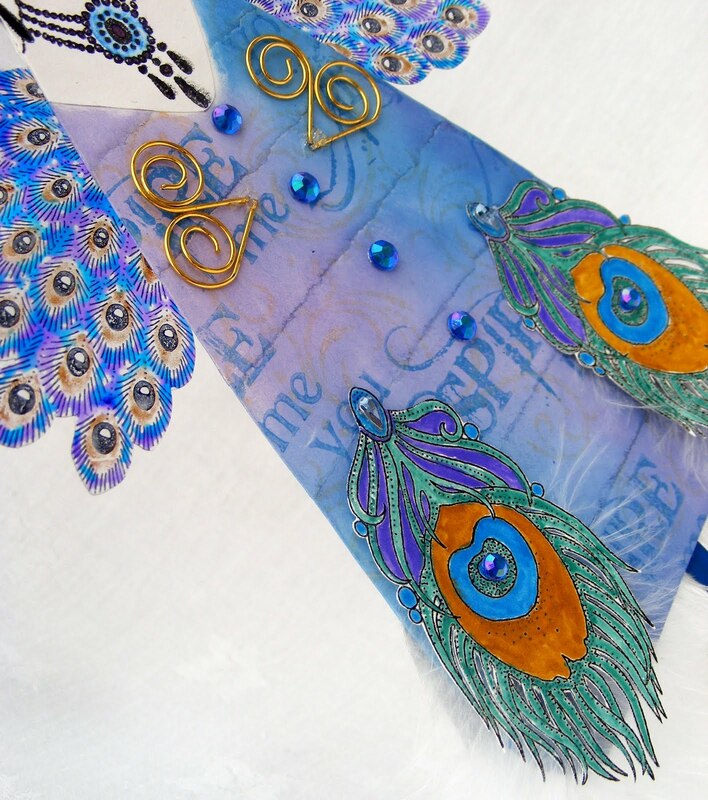 Craft Stamping Quartet: And Next We Have the Peacock Princess! Well I have to say Elaine started this month's end of month reveal with great style and imagination. 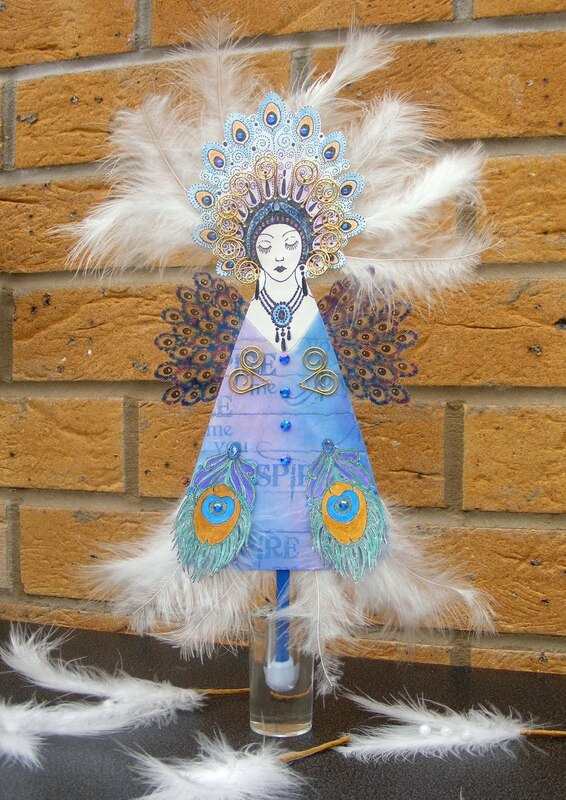 Her art doll is absolutely gorgeous and I want to say a big thankyou to Jo for choosing Sue Roddis' Art Dolls project from last month's Craft Stamper magazine as our inspiration this time. I'm fairly sure I wouldn't have had a go at this if she hadn't and it was really good fun. To a great extent I have gone quite out of my normal comfort zone not only in making the doll in the first place but in making her a bit fluffy and fussy. I've also used quite a bit more bling than I would normally although I suppose it's still quite restrained to some people, Lol! I used Sue's suggested method of making the body with strips of light card covered with a good coat of gesso and then blended Distress Inks to create the colours I wanted. I then lightly stamped a flourish in a golden colour, stamped off once onto scrap, in the background followed by the words You Inspire Me. 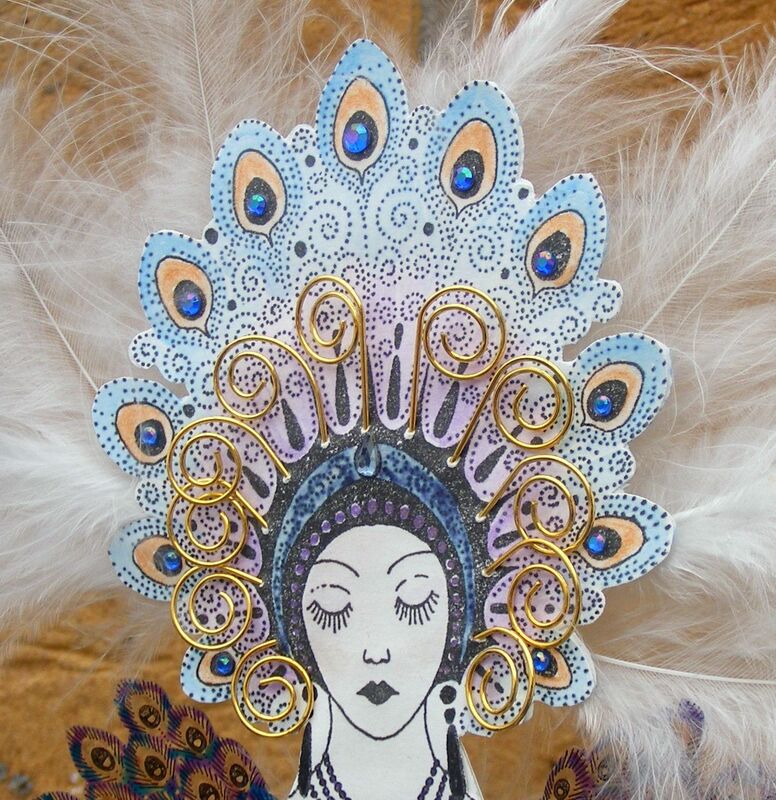 I used stamps from the Elusive Images Peacock range to stamp the head with headdress onto card and coloured with Sakura Stardust pens. I let some ink from the pens flow out onto my craftmat and then picked it up with a water brush so that the colours were quite pale with a subtle shimmer. I stamped and coloured the same image again but masked out the face and then just coloured in hair for the back of the head. I then decorated the headdress with wire clips cut in half, fluffy white feathers and a bit of bling. For the wings I used another of the Peacock stamps, this time onto acetate using Stazon and coloured the back of the image with Sakura Glaze Pens. I trimmed it down and into two to make the wings. I also used the fan spur (?) 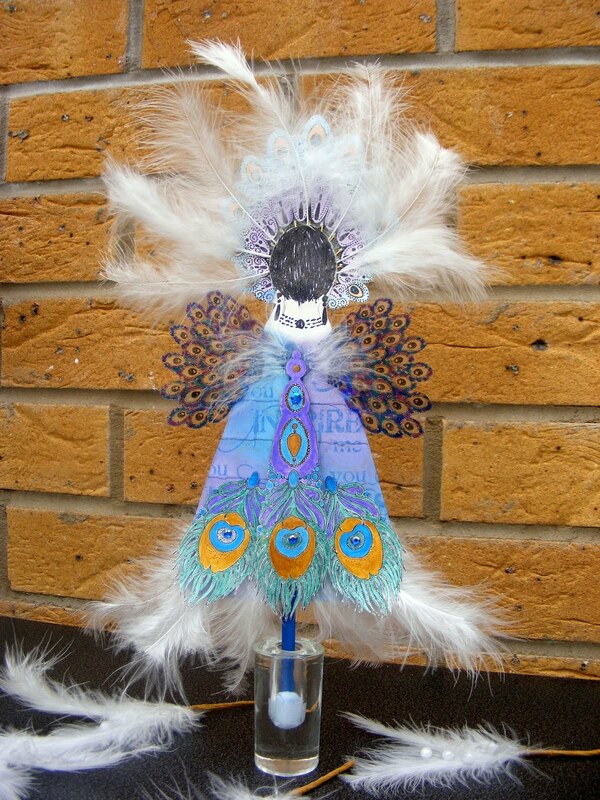 image from the same themeplates, stamped several times and coloured with H2Os, cut out and attached to the bottom of the body together with some more white feathers and bling and I think that's it. Oh yes, I used a well know coffee shop's wooden stirrer for the support at the back which is mostly hidden from view and in the absence of any lovely wooden bobbin, I used a glass taper candle holder which worked perfectly and, I think better fitted her attire than perhaps a bobbin would have done. Well, I hope you like my offering for this month. I'm now waiting in anticipation to see which project Judith chooses for us to play with for the month of April. I'm also really looking forward to seeing Judith's art doll which will be the next one to be revealed in a couple of days followed shortly after by Jo's. Thankyou for visiting once again. Lesley, she is so regal! Gorgeous colours and, like you say, not really your comfort zone. Her gold and jewels are so fitting and I love it that she can give us a twirl and is as well dressed from behind. Glad you enjoyed the challenge of making something so different from your usual projects. 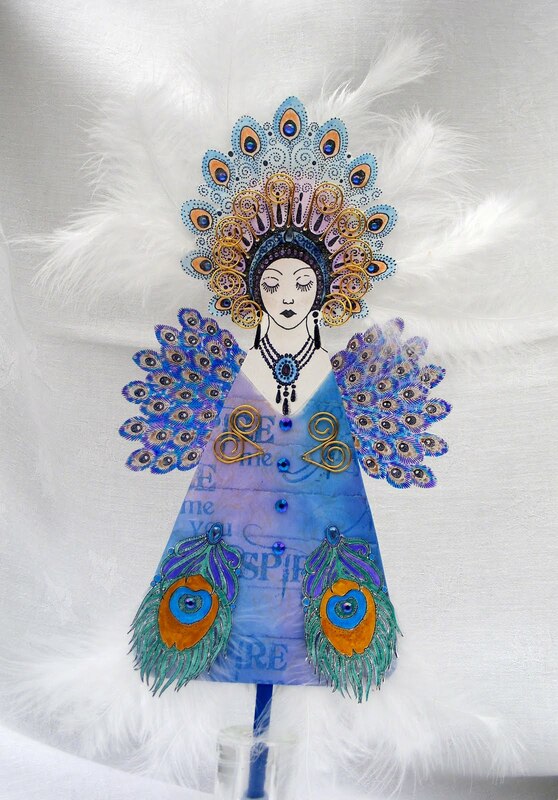 Oh wow Lesley this is great and a wonderful way to use that peacock lady stamp. Congratulations! Can't wait to see what you 4 come up with next! Lesley it is stunning! I really admire you all. This would be way out of my comfort zone too! What a lot of work has gone into this project. She is gorgeous and I particularly like the acetate peacock feathers on her wings. The metal clip detail is very effective. Clever you! This is really stunning. So much meticulous work, such a gorgeous use of the lovely peacock stamps and perfect soft colouring. The use of the feathers and the fancy clips are just inspired and the glass taper holder suits her stylish elegance so well. I am so impressed the back looks as good as the front - I certainly couldn't show mine! This is turning into a really interesting challenge hasn't it. I can't wait to see the other girls' dolls too. Wow - a real peacock princess, love her! Well done Lesley - this is fantastic. Completely out of my comfort zone too but you have produced a fantastic project. Such stunning colours and detail that is equally fantastic both from the front and the back. This is such and interesting and different blog. I love it. Thank you to everyone for sharing such beautiful inspirations. Wowzer.. That is one fun and beautiful peacock princess! She is gorgeous with all her finery. 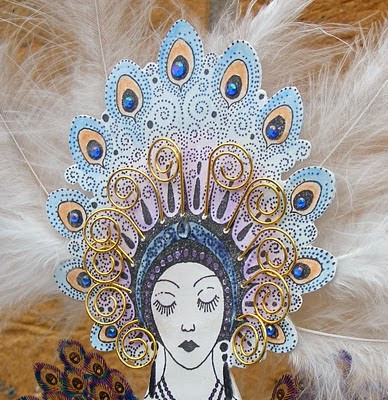 Love all the details you put into her dress, feathers, headdress. Love this doll too and it is really good to venture outside of the comfort zone now and again. Obviously this challenge is a good way to do it too and I look forward to seeing the next one. Such a classy princess she is too! I love the colouring, just perfect peacock colours. Like a lot of admirers, this would be way out of my comfort zone, but I guess also that is the only way to to see if it is possible, and have fun along the way. I think your group is such a lovely way to explore new ideas. What a quartet of talented girls you are i love everything you have done. It was great seeing you yesterday Lesley at the shop and keep up this amazing work its all so beautiful. very clever...adore everything about this wonderful creation!